including anorexia, bulimia, binge eating disorder, ARFID, as well as unspecified eating disorders. She sees clients of all ages for disordered eating as part of our nourishED program. She enjoys working with all ages, and specifically the adolescent population. Rebecca believes in a non diet approach, as well as health at every size. She feels it is important to question traditional “diet culture” and learn what works for you, and she is ready to help you along that journey. No matter where someone is along that journey, they deserve treatment. She is passionate about clients learning to have a healthy relationship with food, as well as a healthy relationship with physical activity. Rebecca also has experience working with clients with Type 1 and Type 2 diabetes; including modifying eating habits, importance of physical activity, insulin injections and titration, as well as glucose monitoring. 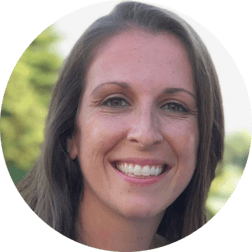 Rebecca has provided education within group and classroom settings, as well as one on one. While Rebecca is not at Nourish, you can find her spending time with her family, being outdoors, or trying out some new recipes. Like most dietitians, Rebecca loves food and the joy it can create. She also has a passion for running and traveling with friends and family to races throughout the Northeast!